The fabric line that kicked this all off was Weekends by Erin McMorris, an old line from 2012. I had some of the line, as well as some of Erin’s Wildwood line in my stash so I was able to get enough fabric to make a decent sized quilt. 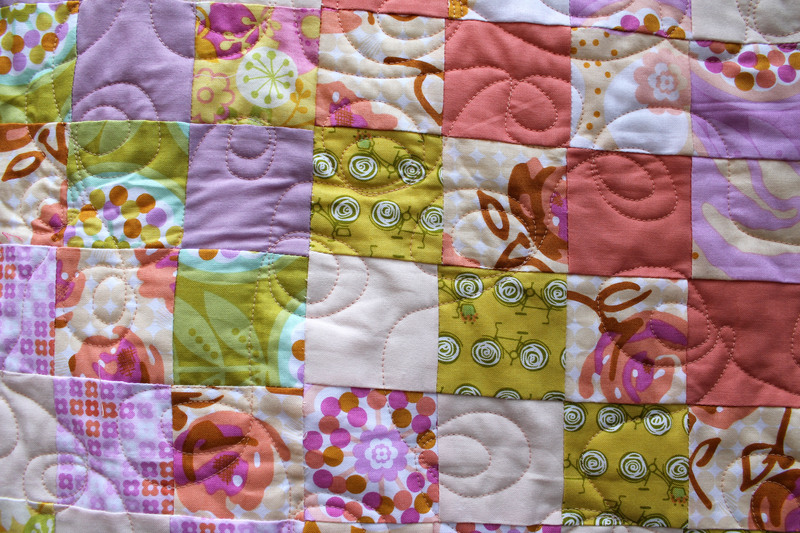 I love the colour palette of this quilt, olive green, apricot, soft purple, dusty pink and cream. It is a gentle but vibrant colour scheme. 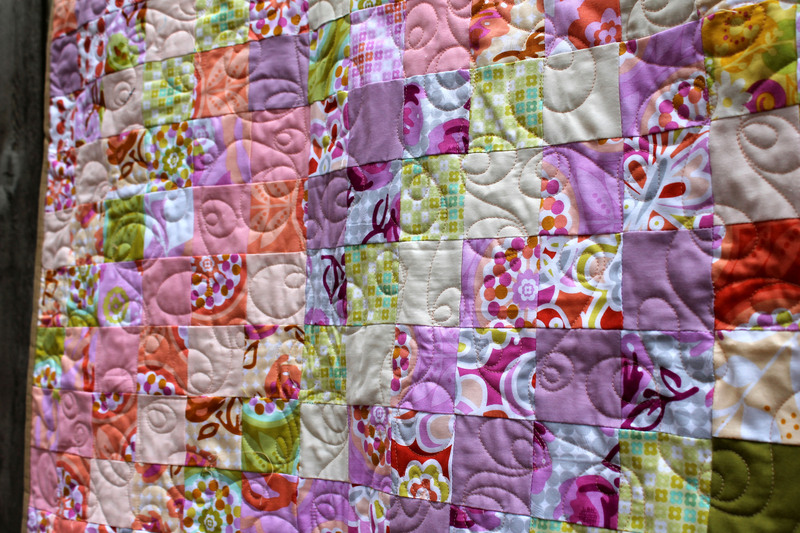 This quilt top finished up big, particularly for me, and there was no way I was going to be able to quilt it on my home machine…my busted back just will not let me. 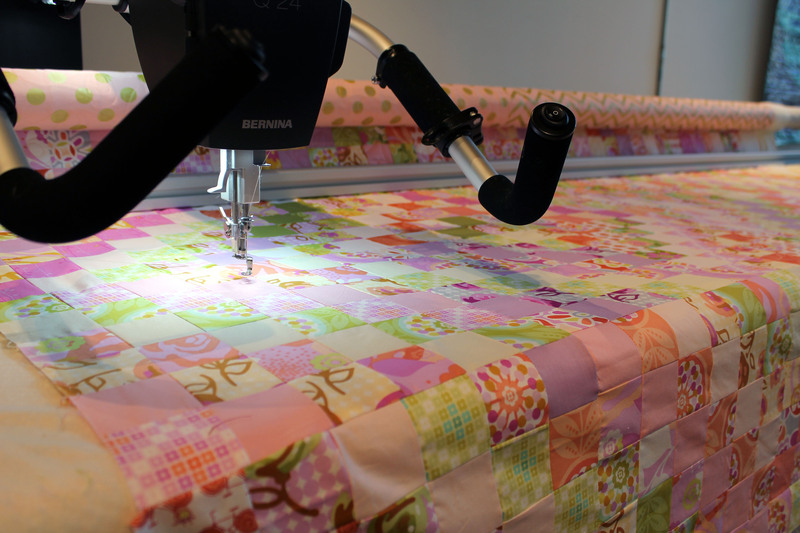 So my local quilt store, Modern Domestic, kindly allowed me to throw the quilt up on the Bernina long arm. 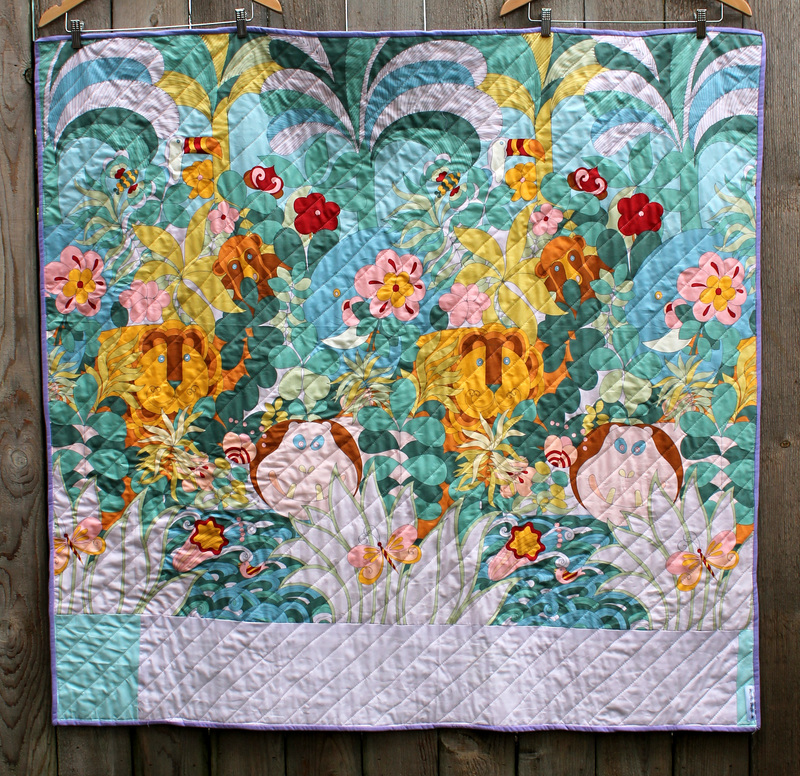 It was so much fun to quilt loopy flowers into this quilt using the Q24 longarm. I am slowly getting more confident with free motion….very slowly….and love the adjustable handles on this baby…. it makes it so easy to find a comfortable position to work the machine in. 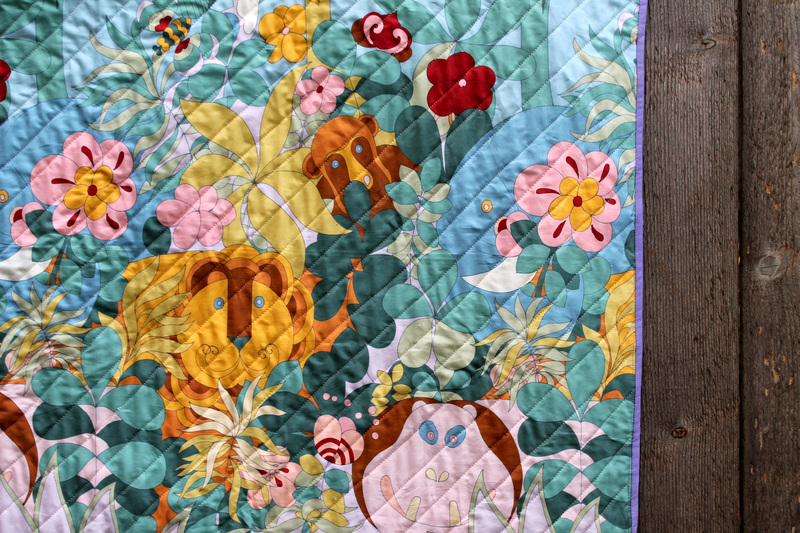 As a label for the quilt I got creative, inspired by one of our Guild long armers, Dawn… and quilted PMQG into the bottom of the quilt. The finishing touches were a scrappy solid binding of beige… not a colour I use often in binding but it worked wonderfully. This quilt is destined for NW Impact’s program that looks after Seniors at risk… it is fun to be charity quilting this quarter for an older set, as it has forced me out of my usual bright novelty kids centered world. 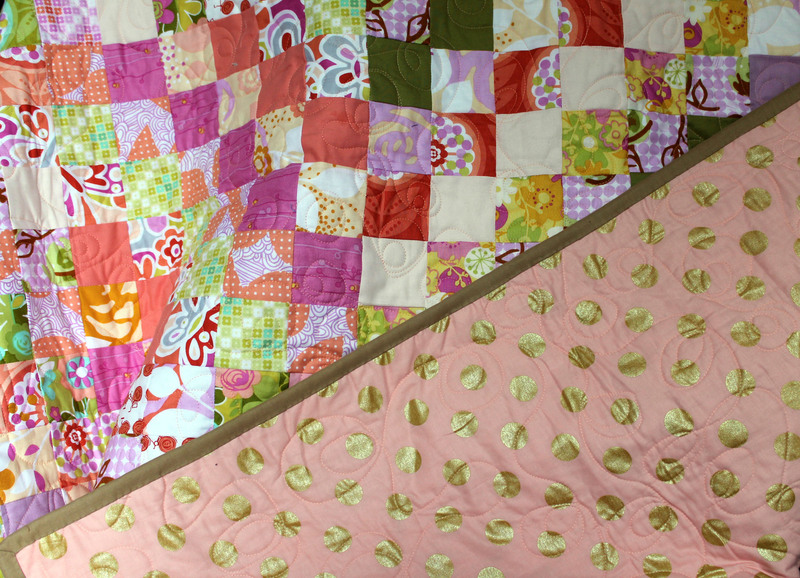 I committed this week to try to finish a quilt a week for October… and I mean baste, quilt and bind. 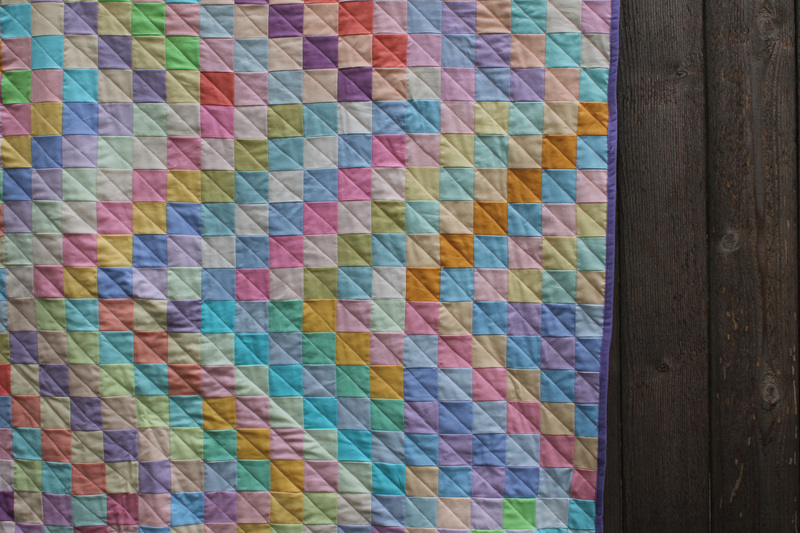 I want to try to get as many quilts finished and delivered to Project Linus before the holidays. A crazy goal I know, but I have to give it a go. 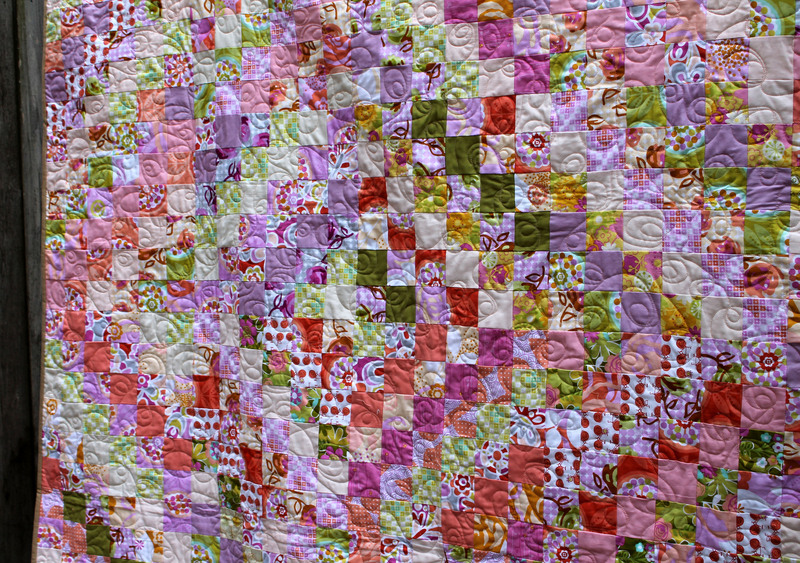 To start this slightly mad schedule I decided to make another trip around quilt. 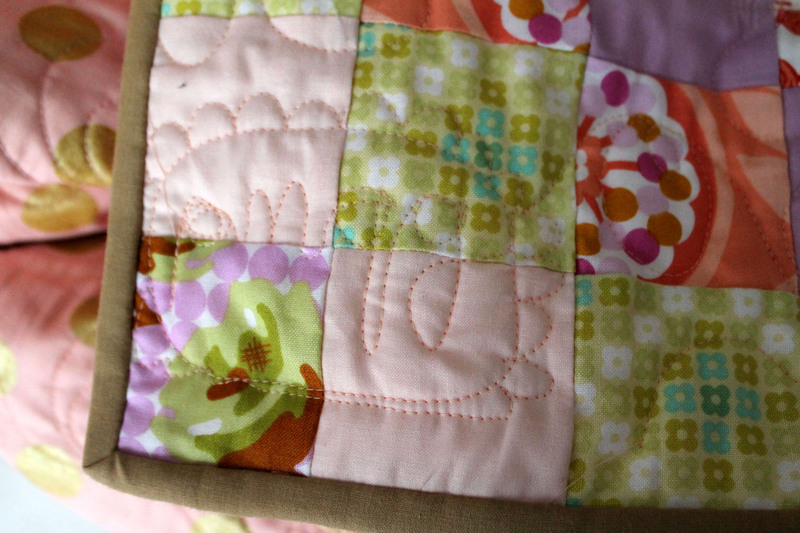 I love these quilts, they are so easy and fun to make. This one is a little different for me can you tell how? Those of you who know my work will note a distinct lack of pattern on the fabric. Yep I made a completely solid quilt. I have only made one of these before and it was a disaster, luckily this one came out much much better. 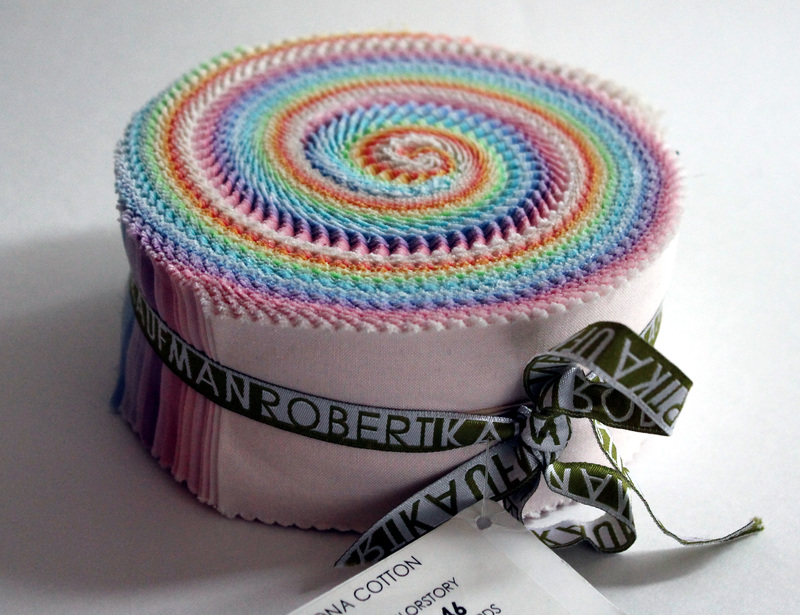 My Trip Along started life as a jelly roll, that has been sitting in my stash for quite a while…. I love the colours of the roll, but did not know what to do with it until I had to make some Bee trip around blocks recently. 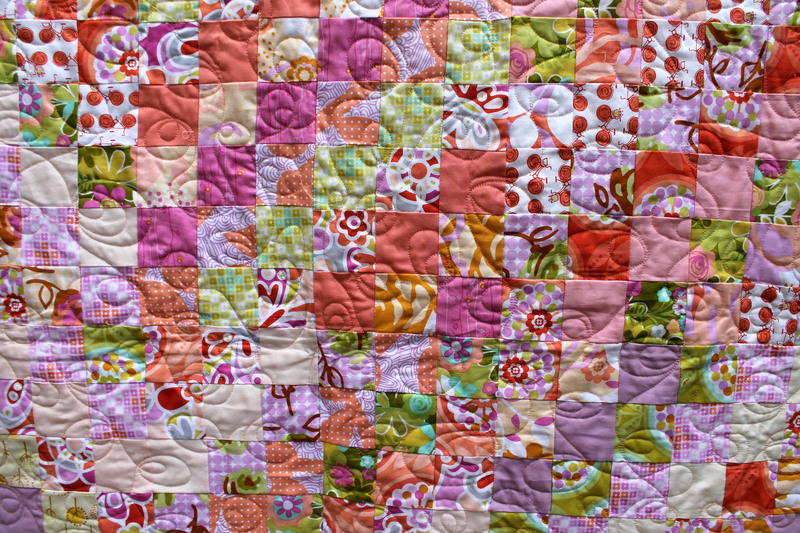 Those blocks inspired me to make another Trip Around quilt and so the fun started. 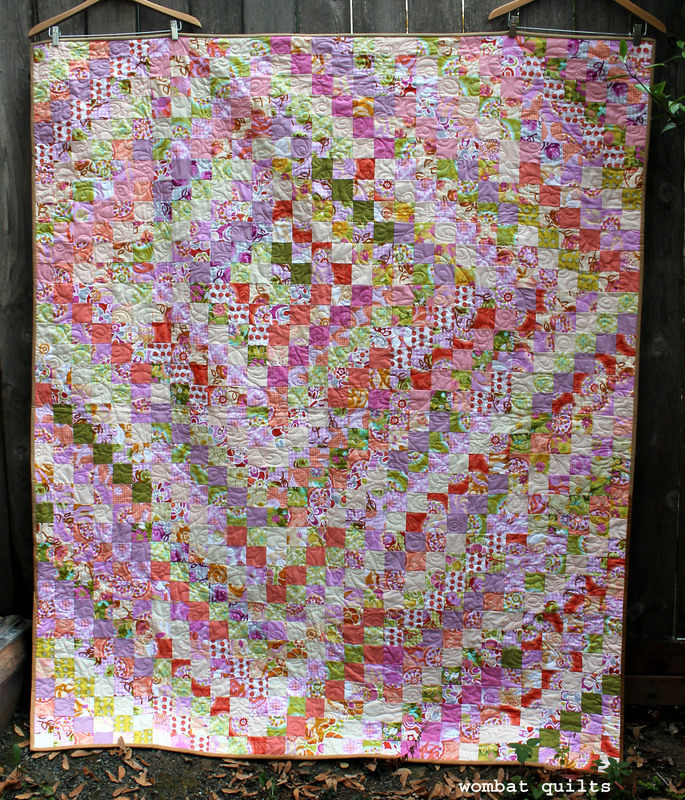 I managed to get 16 x 12 inch blocks out the one jelly roll (with a little finagling to get the last block complete). 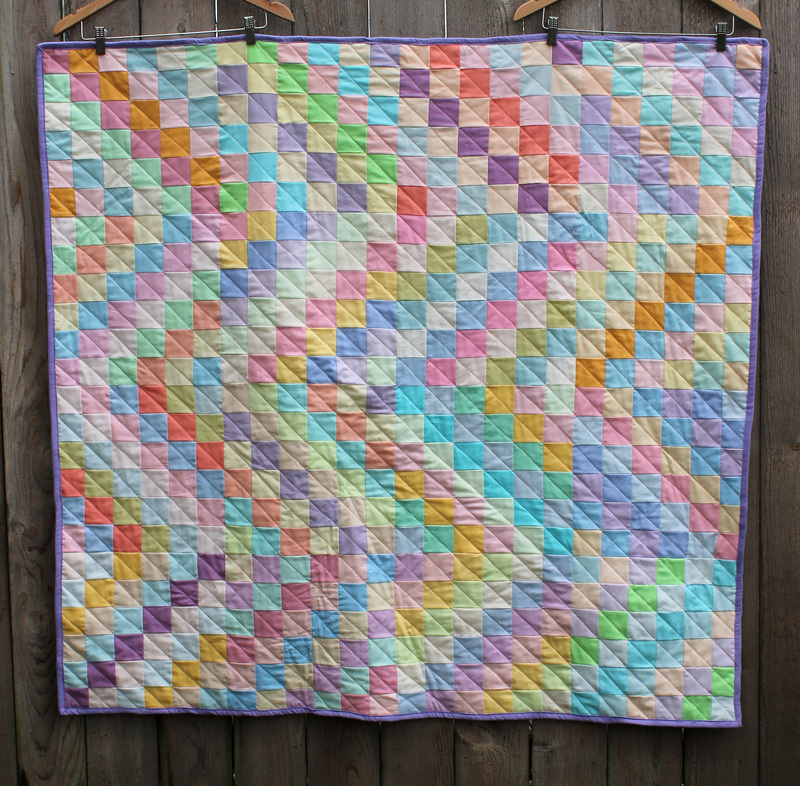 With the first Trip Around quilt I did I went scrappy, bright and used the traditional block layout but with this quilt I went with a wave layout. My hand is still not allowing me to do any quilting other than straight lines, but luckily I think it works perfectly with this quilt top. I quilted diagonally across the top using a nice Sulky thread to add some shine to the stitches, my way of compensating for the lack of print on the fabric. To finish it all off I had to find a piece of backing fabric that would compliment and offset the solid fabric front. I was thrilled to find in my stash this AMAZING Alexander Henry print. Here is a close up detail on the fabulous jungle print. 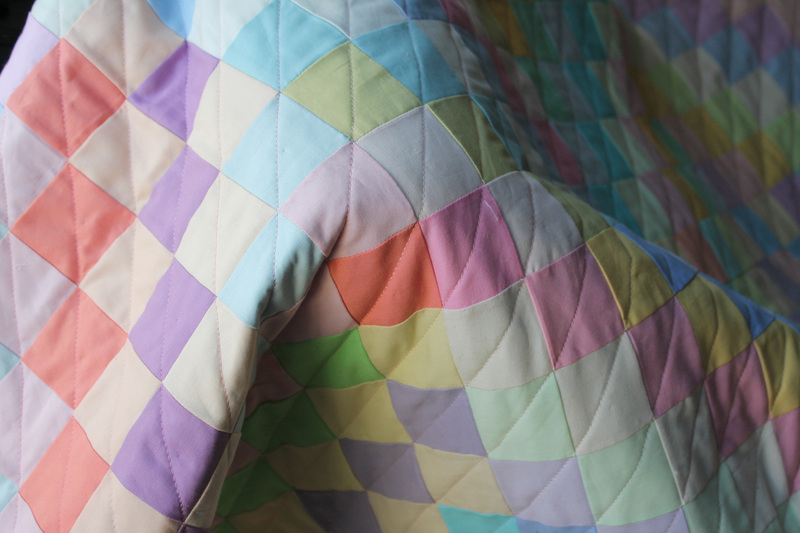 It really is the most perfect fabric for this quilt. 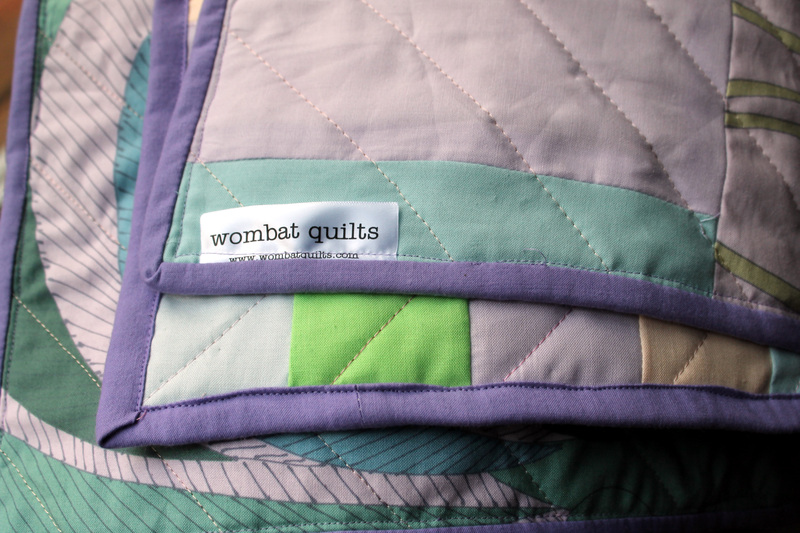 All that was left was to label and machine bind the quilt. Staying true to the front of the quilt I went with a Kona solid binding in dusty purple. 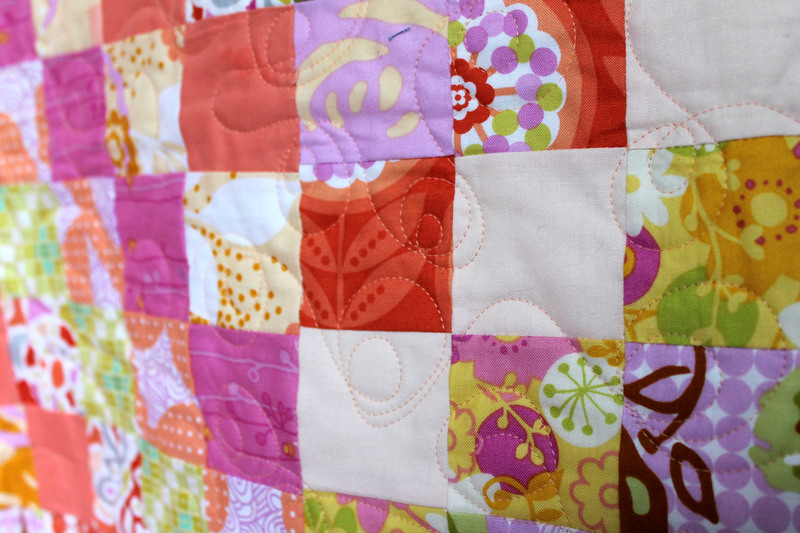 Fine print: I do reserve the right to subtly or not so subtly pull out of my “one quilt a week” schedule. I also reserve the right to call myself crazy for setting such a schedule.